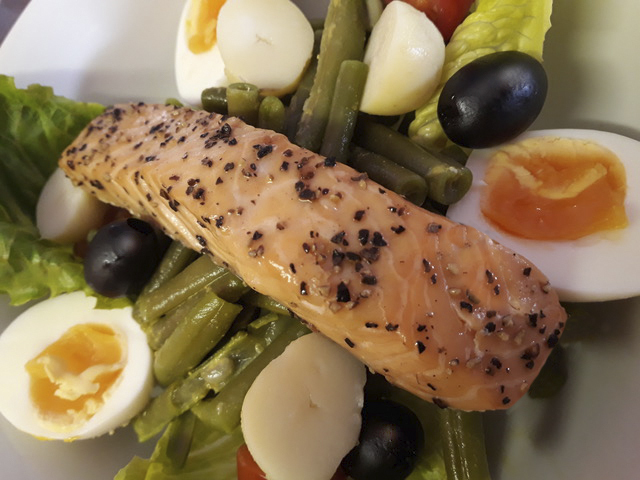 “Hot” smoked salmon niçoise refers to the method of smoking used for the salmon. Most smoked salmon is dry-cured in salt for days, which draws out a lot of the moisture. Then it’s smoked in temperatures below 80°F. The cold smoke doesn’t cook the fish, and it keeps its raw texture. (Like the vacuum-sealed packs in supermarkets or Duty Free.) The other method is hot-smoking. Here, the fish gets a wet-brine soak and is then smoked at temperatures above 120°F. It’s delicious.